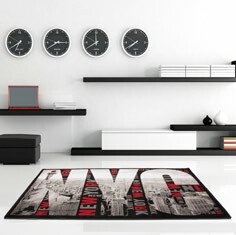 Italy rugs - These eye-catching and uber modern rugs will fit perfectly in a contemporary, minimalist space. The reds, silvers and blacks used to create the stunning detail in the Italy rug draw the eye in and make a real statement in any room. Perfect for laying on hardwood or laminate flooring, these rugs are like having a work of art in your own home. Not only do the colours harmonise together creating a beautiful design, these rugs are also incredibly durable and will withstand heavy foot traffic, which is why they are perfectly suited to your living room, dining room or bedroom. Be transported to Florence, New York or Venice with a stunning and affordable Italy Rug. But remember, just because we call it a cheap rug, doesn’t mean it isn’t excellent quality!